Super moist banana bread laced with creamy peanut butter and topped with chocolate chips and sea salt flakes. 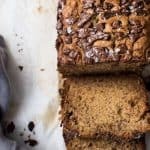 This quick and easy banana bread is perfect for breakfast or dessert! Prep: Preheat the oven to 350°F and move the rack to the bottom third position. Grease a 9×5-imnch loaf pan or line with parchment paper and set aside. Mix: In a large bowl, whisk together the flour, baking soda, salt, and cinnamon. Using a standing mixer fitted with the paddle attachment (or a handheld mixer and large bowl), beat the butter and brown sugar on medium high speed for 1 minute until smooth. Add the bananas and peanut butter and beat for another 30 seconds – mixture will look curdled, but it will come together. Lower the speed to medium and add the eggs one at a time, beat well after each addition. Add the sour cream and vanilla extract on until combined. Reduced the speed to low and slowly add the dry ingredients until flour is fully incorporated but mix as little as possible. Bake: Transfer the batter into the loaf pan and sprinkle with chocolate chips. Tent the pan with aluminum foil and bake covered for 30 minutes, then remove the foil for the remaining 30 minutes (60-65 minutes total cooking time). To check the doneness, insert a toothpick into the center of the loaf. If it comes out clean or just a little crumbly, the bread is done. Remove from the oven, sprinkle with sea salt flakes and let cool completely before slicing.